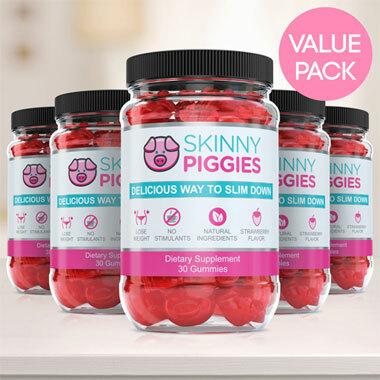 Skinny Piggies are delicious fiber gummies formulated to help you lose weight. Skinny Piggies fiber gummies contain a combination of natural ingredients that will help you curb hunger and suppress appetite. Using Skinny Piggies is delicious and fun: Just take one gummy 30 minutes before your meal and you will get full faster and eat less. This will help you maintain caloric deficit without being hungry and that will help you lose weight easier and quicker. We recommend taking one Skinny Piggy fiber gummy at first, 30 minutes before your lunch. After one week, you can gradually increase fiber amount up to one gummy three times per day. Click here to purchase these delicious fiber gummies. Do you love indulging in delicious treats but also want to slim down? Now, there's a new dieting product that allows you to snack without guilt. 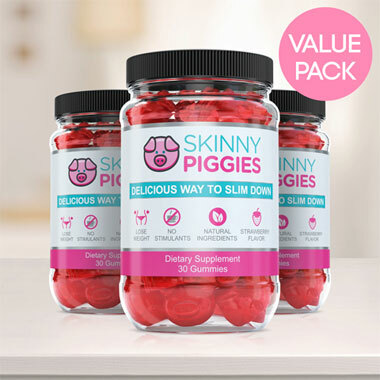 Skinny Piggies delicious gummies are designed to help you reduce sugar cravings and can make you feel more full, while helping your body shed pounds in the process. The key for slimming down means consuming fewer calories than you burn. Unfortunately, that usually results in an uncomfortably grumbling stomach all day long. is simple: Consume less calories than your body burnseach day and you will start losing weight. But when you start lowering calories, food cravings will set in, and appetite becomes hard to deal with. That's where Skinny Piggies come into play! These delicious appetite suppressant supplements are created to help you to stick with your diet by helping you suppress your hunger. The idea is surprisingly straightforward. Your appetite is regulated by two key ways: the calories you eat and the feeling of food in the stomach. After a large meal, your stomach expands by the food pressing on the sides, which results in you feeling full and no longer hungry. When you ingest one Skinny Piggy just a half hour before your lunch with a tall glass of water, it will expand to a soft gel, activating food receptors in your stomach, telling the brain that you ate loads of food. With this, when you do eat, you're partly full and end up eating less calories thanks to it. That means you can reduce appetite and eat much less, without feeling like you're eating less than before. When you take Skinny Piggies weight-loss fiber gummies before meals, it will cover your food in a gel. That reduces the movement of the glucose into the blood stream. That helps keep the blood sugar more stabilized and ensures you are in fat loss mode all day. It may perhaps even make your workouts much easier. There's no end to the types of fat loss products on the market. From fat loss pills to appetite suppressants, it's impossible to find out what fat loss product is right for you. Going through the research on each product is a fruitless task, but Skinny Piggies stand out among the rest for the following reasons. 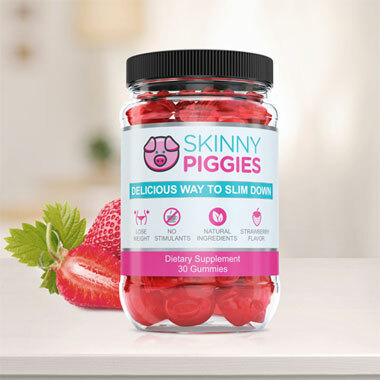 Great Flavor: Very few diet supplements taste great, and almost none of them have the delightful flavor of strawberry gummies, that's exactly why Skinny Piggies gummies are a snack you'll really enjoy. Genuine Ingredients: Unlike most weight loss supplements, it's actually easy to pronounce all active ingredients in our diet gummy supplements, ensuring that you're filling your body with the best quality nutrition. Well Balanced Nutrients: In addition to helping you lose weight, they also help the stronger hair and keep your skin looking younger. No Chemicals or Stimulants: Taking a weight loss supplement with no stimulants and that's why there aren't limits on when you can use them. Losing weight is difficult, but Skinny Piggies are ready to make your efforts easier. You will like the refreshing taste of our weight-loss fiber gummies so much, remembering to take your health supplement will be easy. 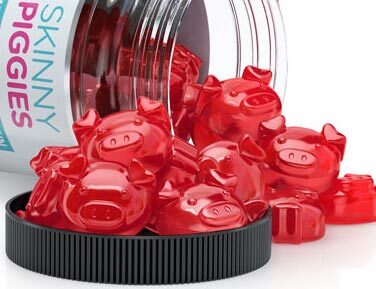 Easy to take and satisfying, Skinny Piggies are supplement gummies that can help you too.